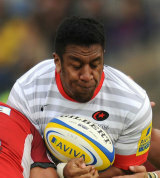 Mako Vunipola is set for a bright future in the game both for club side Saracens and England. He starred for England's age group sides, winning Grand Slams at U18 and U20 levels and appearing in the 2011 Junior World Championship final against New Zealand, before making his senior bow against Fiji in 2012. His father Fe'ao captained Tonga and appeared at the 1995 and 1999 World Cups, moving with his family to Wales in 1998 to play for Pontypool. Mako was educated in Newport, at Castle School, Bristol and at Millfield in Street. He made 33 appearances for Bristol before the switch to Saracens. His younger brother Billy, 19, made his name as a back row forward for London Wasps and the two played together for England at U18 level and Billy will join his older brother at Saracens for the 2013-14 season. After impressing for Saracens Stuart Lancaster had no hesitation in handing Vunipola an England debut in the first autumn Test of 2012 against Fiji. He added three more caps off the bench before the end of 2012 and was on the field at the final whistle when England became the first team to defeat New Zealand since their World Cup win over a year earlier. The Wellington-born player came off the bench for England's first three matches of the Six Nations before he made his first start against Italy. He was back on the bench for the deciding match against Wales and while he came off the bench it wasn't a happy day as Wales ended England's grand slam hopes with a 30-3 win. Further impressive performances as Saracens reached the Heineken Cup semi-finals kept him in Warren Gatland's thoughts and he was duly rewarded with a place in the Lions squad for their three-Test tour to Australia. His awesome form, and a few injuries, led Vunipola to play an important role for the Lions. He came off the bench in the first test against the Wallabies but struggled in the scrum in the second test after starting the game. He returned to the bench for the final test as the Lions wrapped up a series victory.